Instagram developers implemented the ability to attach background music to Stories. 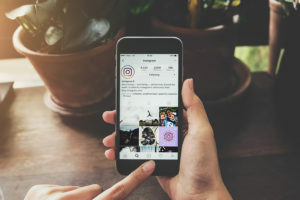 Instagram is one of the biggest networks, with over 400 million people using it every day, so the company strives to constantly develop it, supporting users' interest in new features. Adding music to your stories has now become a bit easier. You need to open the menu with stickers, click on the icon with Music label and select any of the tracks available in the library. After selecting a song, you can select the desired area and overlay it on your story. Also, music can be added when shooting a video – now a corresponding icon appeared under the record button. When viewing music Stories, users will see a sticker with the name of the song and the name of the artist. In the future, library will be replenished with new tracks and performers. In addition to that, Instagram has old methods - its own photo and video editor, the main functions of which are applying of various filters. For a computer, there are many video editors that can easily cope with this task. One of the most popular editors is Sony Vegas, but since it is designed for more professional editing, we'll use an easier editor such as Bolide Movie Creator. It is easy to use, and takes up little space on the hard drive. Download Bolide Movie Creator from their official website. To start editing a video, you must first add it to the editor. To do this, click on the button "Add photo/video to the library". Then find the video you want on the computer, and click "Open". Next, you need to drag the video into the box below, as shown in the screenshot below. After that, we will add music to the editor. Go to the tab "Audio" and click the button "Add audio files to the library". Look for the desired track on the computer, and click on "Open". The track was uploaded to the library, now it needs to be added to our video. To do this, add a track by clicking the "+" icon. Now take the track and drag it to the created track. Cut off an extra piece of the track. Press "Ctrl+Q". By this action we will cut the track. Now select the unnecessary part of the track and press "Ctrl + X". By this action, you will cut out unnecessary part. Now we have almost done video for Instagram. What’s left is only to remove the old sound from the video (if you want it). To do this make a right-click on the video track and select "Adjust volume". Put the mouse on the field in the middle of the track, and pull it down until there is no sound. Now save the result. Click the button "Save video" and select quality in the popup window. After this save the result and assign the file name. 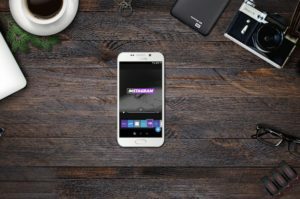 Today there is a fairly extensive list of applications aimed at video editing or unpretentious processing, specifically for Instagram. Being more precise, it's worth recommending the iMovie application for iOS, PowerDirector for Android and VivaVideo for both mobile platforms. 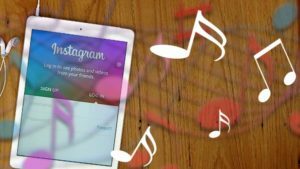 Here, we’ll show you how to add music to Instagram stories through the example of the last application. Download the VivaVideo application and install it on your device. You can do it for iOS or Android devices. Launch the application. First of all, you need to open video editing section by clicking the "Edit" button. The screen will display your device gallery, in which you will need to find and select a video, from which further work will be performed. First of all, the service will offer you to trim the clip, change the format or rotate. Please, note that the duration of the video for Instagram should not exceed one minute, which means that at this stage you can prepare a video for publication. When you have finished, tap the Confirm button. The selected clip is displayed at the bottom of the window. Click "Finish" button. Video editor appears on the screen. Select the "Music" section to perform the task set by us, and then tap on the button "Click to add". The default screen will display a list of free tracks, for which you do not need to purchase a license (if the sound is protected by copyright, then Instagram is not allowed to publish such a video). You can use one of the solutions offered by the program, as well as choose your own music downloaded on your device - you need to go to "My Music" tab. The next moment, music will be added to the video. If necessary, in the section below you can adjust the volume of the sound from the video - it can be made louder, so that the added music appears on the background, or completely disabled for cases when new music requires complete replacement of the existing audio track. When you have finished editing the video, click "Send" button. You can now export the finished video to your device gallery or immediately open it on Instagram - just select the option you like. When the video is opened through Instagram, complete its publication by enclosing it in your profile. That's it. We hope, you find this article helpful.